The secret is getting out. Smart marketers … yes, smart marketers … are outsourcing their pay per click campaigns. Why? Because paid search professionals can flat out get the job done. Mistakes in paid search are costly — especially when repeated day after day, month after month. The study was shocking. Even these advanced web marketers were making what we would consider beginner mistakes. If these online marketing professionals are making expensive newbie mistakes, that doesn’t bode well for the average business. 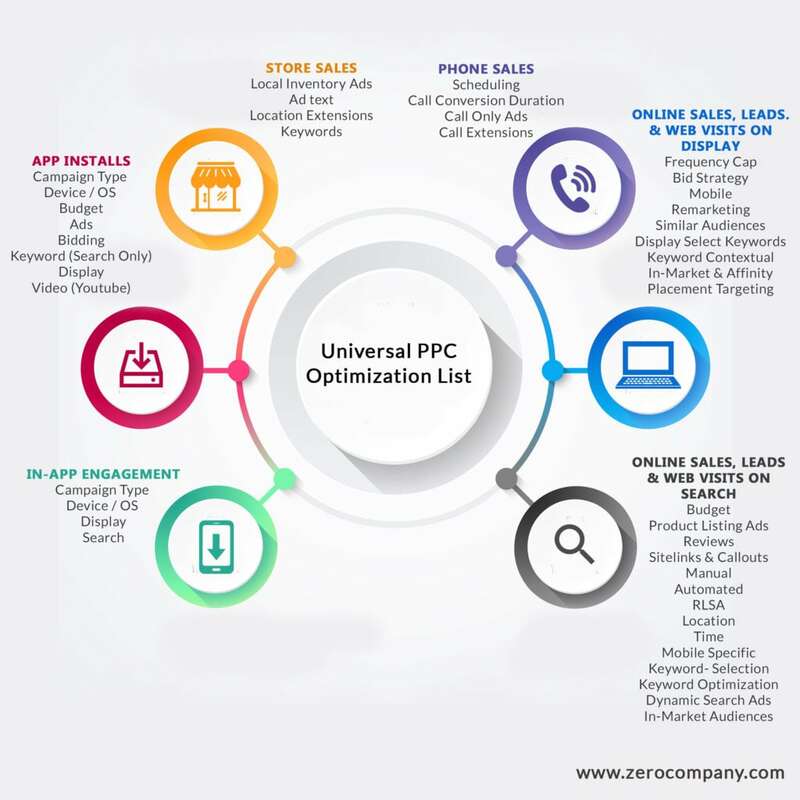 Zero Company Performance Marketing, a Top 10 Ranked PPC Management company (TopSEOs), is your secret weapon in pay per click advertising. Whether or not you have an existing PPC account it is rare that an account is set up correctly. Most accounts will require an overhaul. The devil is in the details, especially over at Google. Our specialists, however, have learned from people like former Google AdWords employees how to best optimize an account. Most client accounts we see are improperly configured — and they pay the price on a daily basis. We start with an optimized foundation and work from there. Our staff has been mining keywords for a decade. You begin to understand a lot about the nature of good and bad keywords in that amount of time. You understand what phase of the lead generation process or buying process consumers are in. You know how to weed out the bad traffic. You also learn that not all keyword suggestion tools are the same, and if you just use the tools offered by Google, Yahoo, MSN … you are missing keywords. We can take a simple 50-100 keyword account and can often turn it into 1,000-2,000 or more relevant keywords. If you are not testing PPC ads on a daily basis, you’re missing a critical advantage of pay per click advertising. Fine tuning can make a world of difference in the paid search algorithms. Zero Company uses unique technology to check your ads daily to stop and start tests as soon as the data dictates. This ongoing tweaking of ads is key to click-through rates, costs and your return on investment. If you spend a lot of time direct marketing to your clients through the mail, you may know how important testing is. Simple changes in messages and mailing materials can affect the results. Those tests take weeks. With Zero Company pay per click management, we will be testing hundreds of different and keyword relevant ads for you every day. Once a test is complete, we start a new one. Think of how powerful that is. Hundreds of ads, multiple variations of each … monitored and tested daily. We will hook up your site with complete and robust web analytics. This is vital for determining your ROI at the keyword level. It’s essential to know which keywords are paying off and which aren’t. It’s not enough to know that you spend “$5,000 a month to make $12,000.” What if $1,000 a month of that ad spending brings back no business? Could it be better utilized elsewhere? Most certainly. We dig deep to optimize your ad spend. Because of continual changes in the paid search marketplace, it is vital to monitor your accounts on a daily basis. Whether it’s testing ads as mentioned above, fine-tuning bids, expanding keywords, or handling large changes like Yahoo’s “Panama” conversion … ongoing account maintenance is mission critical. The marketplace is fluid, the competition changes tactics — you need someone to stay on top of it. And you don’t just need effort, you need intelligent effort. Your business may have seasonal influences, a rise in competition, new products and services, special promotions, revenue goals or a variety of other issues that can come into play at any given time. Many of these changes need to be addressed in paid search campaigns. Zero Company can adapt to these needs and objectives to help you grow your bottom line. We work with you to define marketing objectives, metrics and budget. From there, we will deliver a proposal, including messaging and budget options. Once the proposed ad campaign is developed, we get approval before launching. After launch, we continually monitor and modify campaigns to meet your objectives. We will share reports and continue to make refinements. Because of the labor-intensive nature of taking on a new client, we limit the number of new accounts we take on. If your website isn’t ready or you haven’t generated a lead or made a sale online yet, you probably aren’t ready for our services. Many other SEM companies won’t list prices on their sites. What you will find is that they often charge 15 to 20 percent or more of your ad spend. You will even see insane setup fees from $5,000-$10,000 or more. *Ask about our less expensive keyword placement and small budget plans! Note: Some select industries may have higher minimum monthly fees. SPECIAL OFFER: If you sign up right now, we are offering a Free Competitive Analysis Report. Give us the names of three of your top competitors and we will find the keywords they are advertising on. Are they making a killing on keywords that you are missing? You’ll find out where they are at. Sign up today to take advantage of this special offer. If you are interested in signing up but have questions, please fill out our contact form and we will get back to you as soon as possible.